I have been fascinated by the notion of building community as a critical human endeavor and that passion has been the guiding vision of the Art of Community NCW project. There is something transformative about the power of collaboration and cooperation in service of the greater good that stands in stark contrast to the cultural norm that prizes individual gain at the expense of others. I was fascinated to learn more about the work that Wenatchee Valley College sociology professor Rich Brinkman has been doing in understanding the subculture of long-distance hikers and the sense of community that is fostered on the trail. Brinkman and I sat down for an interview and he brought me up to speed on his research. Recently, Brinkman and a colleague presented a paper called “We are Community” at the 2018 Rural Sociological Society Annual Meeting that explored the unique characteristics of the long-distance hiking subculture. 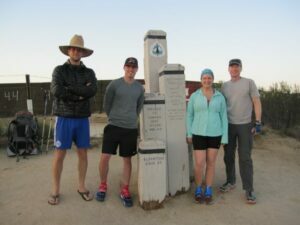 For his research, Brinkman hiked the entire Pacific Crest Trail in 2015 and conducted a few dozen interviews as part of his sabbatical research project. We can learn some important lessons about community building from his work. Brinkman, who was dubbed Roadwalker by fellow hikers during the journey, said the trail becomes an “incredible equalizer” among human beings. The stratifications that form who we are as human beings in American society, such as job, where we are from, where we went to school, etc., become completely irrelevant on the trail for those intent on hiking the entire distance of either the PCT, the Appalachian Trail or the Continental Divide Trail, the three long-distance treks in the United States. Hikers drop their old identity and become more authentic and genuine along the way, Brinkman said. I think it’s generally recognized that our society in general is becoming colder, more transactional and far less relational. Modern society seems to have a damaging effect on social connection. Sociologically, these more impersonal relationships have historically been referred to as “gesellschaft” ties that are inherent in modern society. Despite living in this disconnected world, “people still yearn for community: A place where people can be their ‘truer selves’ and connect closely with others,” Brinkman observes in the “We Are Community” presentation. Brinkman’s research partner, Dr. Kristi Fondren of Marshall University, has spent considerable time on the Appalachian Trail conducting the same research. Life on trail, Brinkman notes, simplifies life. It creates an environment where people care for one another as human beings, or sociologically, pursue “gemeinschaft” ties, meaning community. That kind of connection is fostered on the trail and it’s why many of these folks undergo a post-hike depression as the community spirit of the trail gives way to the road rage and other realities of everyday life that we have become accustomed to. The trail creates a common bond and shared experience increasingly more challenging to find in our society. 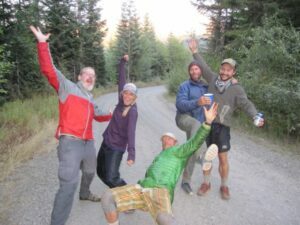 People watch out for each other on trail, and there is the constant presence of “trail angels,” who invest considerable time and energy to selflessly support those making the long treks. The research findings suggest long-distance hikers create “gemeinschaft” or community ties on trail to escape an increasingly impersonal “gesellschaft” world. It is more challenge to achieve this in community, but in the Wenatchee Valley and North Central Washington, I see plentiful examples that we are way ahead of other communities in creating meaningful civic life. This long-term view and giving spirit is the true essence of community here and one that we must continue to support to maintain meaningful civic connections and a sense of us rather than just me. Brinkman, left, with other thru-hikers on the PCT. A sense of community prevailed. The Art of Community Project is dedicated to fostering creative community building. To see stories, podcasts, visit artofcommunityncw.com.